Kevin Matras is a Vice President at Zacks Investment Research, where he is the fundamental stock screening and technical chart patterns expert. He heads the Research Wizard Division at Zacks, which focuses on stock screening and backtesting. Matras also runs the Chart Patterns Trader service, dedicated to chart pattern analysis, and the Options Trader Service, which applies his stock-picking techniques through the use of options. In addition, he manages the Zacks Method for Trading: Coaching Program and Home Study Course. He has been seen on television and quoted in magazines, and his stock-picking articles can be found on various financial sites. 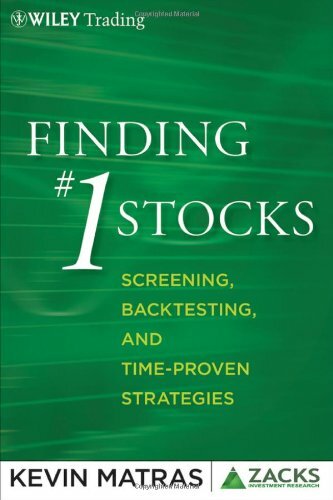 In addition, he is also the author of the book Finding #1 Stocks: Screening, Backtesting and Time-Prove Strategies, published by Wiley and Sons. Matras can also be seen weekly on Zacks Roundtable Review videos along with his popular weekly video segments Screen of the Week and Know Your Options. Every week the government and other entities release economic reports that cover all areas of the economy - from retail sales to housing, to international trade to consumer sentiment. Here are 5 stocks from some of the industries singled out as the biggest job creators in last week's Employment report. One of the best ways to find stocks on the move that are grabbing the attention of investors is to screen for stocks with increasing volume. As more investors buy the stock, the stock's price should go higher. As the trading year comes to an end, now is a good time to reflect on what you did right in the market, what you did wrong, and what you'd like to do better in the new year. With earnings season in full swing, here's an options strategy that's perfect for a company about to report. What a year so far, and we're barely only 6 months in. After one of the worst starts to the market ever, plunging more than -11% in just 2 short months, the market just as quickly made it all back and then some. Did you know that in spite of all the volatility in the markets as of late (or maybe partly because of it), the growth in options trading has continued to rise? With earnings season having officially begun this week, we're going to see both positive surprises and negative surprises. A Bear Call Spread is used when you have a neutral to negative view on a stock. While this strategy has a limited risk, it also has a limited reward. There are many different ways to protect profits and hedge risk in a winning stock. You can use a stop loss order, write call options, buy put options, and more. We're going to talk about buying puts, and compare that to using stops. There can be a place for cheaper stocks in your portfolio sometimes. Here are 5 stocks with big potential. Ratio Back Call Spreads are a strategy I seldom hear anybody talk about. But they can be a great way to position yourself in a trade if you think something big could happen. With earnings season set to officially begin on July 8th, this is a good screen to use both before and after a company reports.